It might not compare to a working set of night vision goggles, but the limited edition 360 bundle for Modern Warfare 2 is no slouch when it comes to excess. Packing a 250 GB hard drive, two controllers and more, this package is all about doing it big. Serious Modern Warfare 2 collectors are going to have a whole room full of giant cardboard packages come this November. In addition to the numerous limited editions of Modern Warfare 2 the game, Infinity Ward, Activision and Microsoft are also teaming up to produce a Modern Warfare 2 styled limited edition of the Xbox 360 that'll come in a deluxe package for $399. 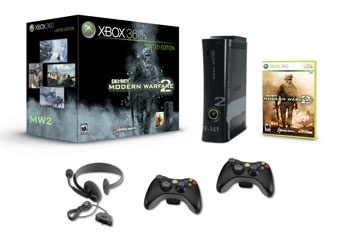 The centerpiece of the bundle is obviously the 360 itself, which comes in a sleek Modern Warfare 2 design with a giant 2 slathered across the front and all sorts of cool-looking, though, at least to me, totally meaningless words and codes (yeah, it still looks cool) all decked out in austere black and gray. There's more than meets the eye when it comes to this system, though: it sports a hefty 250 GB of storage space on its hard drive. I can't imagine you'll use all of that for Modern Warfare 2 saves. If you do, well, I don't know what to say. Rounding out the package are two wireless controllers (coming in matching black), a headset (yes, also black) and a copy of Modern Warfare 2. That's the standard edition, so no art book, vouchers for Call of Duty Classic or goggles. Goggles or no, the bundle's up for sale on the same day as Modern Warfare 2 - November 10 - and is available for pre-order right now. Might want to get your hands on a pre-order slip now if you can - people might be snatching this one up for the mucho storage space, regardless of any Modern Warfare fandom.